Sometimes I surprise myself with how much knitting I can get done when I’m focused. So far in 2016 I’ve been really focused. So far I’ve finished 4 adult sweaters, 1 toddler sweater, a hat and a baby blanket (that has yet to be delivered because I swear the US Postal Service has it out to get me). I’m almost finished with a another cardigan too, I’ve just got the second sleeve left – I can see the light at the end of the tunnel! Didn’t I tell you sweaters are my thing? LOL And currently stash busting is also my thing. 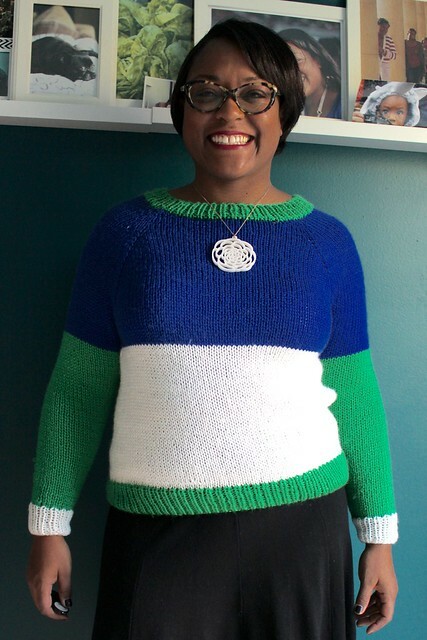 I decided I’d use up my stash and do some fun color blocking with my last sweater because if I don’t whittle the stash down I can’t buy more yarn. This is my Lesley sweater, it’s from the Home and Away collection by Hannah Fettig. You might remember my Boothbay from this collection as well, I really love a lot of the patterns in this collection. 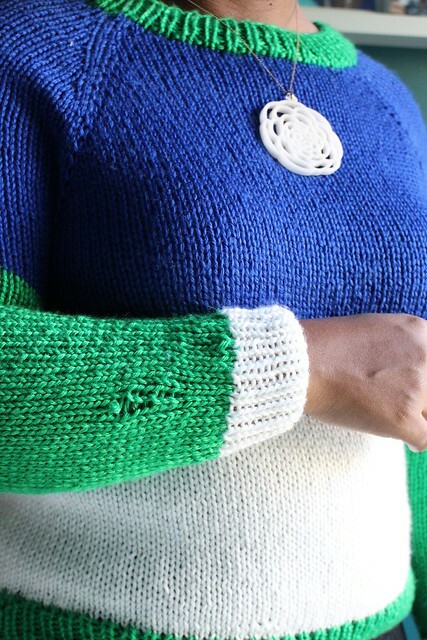 I’m using the Mighty Stitch yarn from Knit Picks that I originally used on my Garter Raglan back in December. I really love the color of this green and thought it would pair nicely with this vivid blue. Bright green and blue are a favorite color combo of mine. Honestly, I just love color. I’m feeling happier with my knitting so I think I’m reflecting that in my yarn color choices too. And then I decided to switch it up and to contrast the color block on the sleeves. Instead of just blending in with white sleeves and the white body all the way across I thought it would pop more with green sleeves. I love how it turned out in the end. What I don’t love is when you realize you’ve made a mistake AFTER you’ve blocked it and were putting it on to take a picture. You see this? It’s a lovely dropped stitch in my sleeve. I knew I was one stitch off when I got to the cuff but couldn’t see it when I was knitting so I thought I just miscounted. Nope. But my friend Lavon pointed out that this is a common thing and she even showed me pictures on Ravelry of designers sweaters with a dropped sleeve stitch. But in reality, that’s how you know it’s handmade – it isn’t perfect. Aside from the dropped stitch this is such a warm and cute piece. I do feel like this is the second Hannah Fettig pattern where I should have done a stretchier bind-off for the ribbing though, so I will need to keep that in mind in the future. But this one isn’t so tight it isn’t wearable, I just think I’d like a bit more give at my hips. And since it’s an acrylic blend yarn, it’s not super hot. This is going to be a nice transitional piece during this weird winter into spring. So tell me, what’s currently on your needles? I’m doing my gauge swatch for the Shiloh Sweater from Winter 2016 Interweave Knits. I’m using Cascade 220 Natural. And here’s a shout out to Cher…so adorable! Beautiful sweater Dana! You are inspiring me with all your knitting! I can’t wait to get home from work tonight to really start on my sweater. I don’t have to go anywhere this weekend. It’s going to be super cold here in Chicago through tomorrow and then snow on Sunday. Perfect to stay inside and knit! 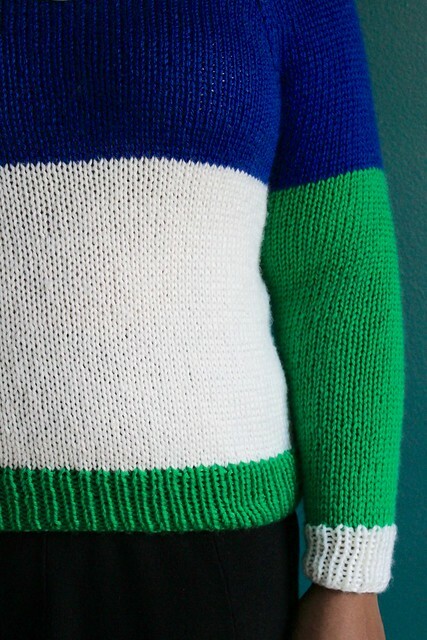 I am glad I can inspire folks to get to sweater knitting, it’s my favorite! Also I have checked out that Shiloh sweater and I love the cables and shawl collar! 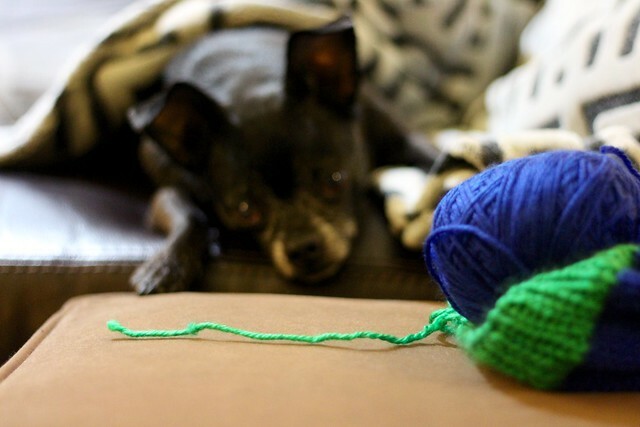 I definitely want to see it when you finish it and this cold weekend in Chicago is definitely a perfect weekend to stay in and knit! You already know I love this one you but I have to say it again — it looks wonderful. And as for that dropped stitch, just call it a design element. LOLOL! I was so mad when I saw that dropped stitch but I sewed it in and it’s barely visible…but I know it’s there. I LOVE how you colorblocked the sleeves differently than the body! It’s fantastic. You’ve been crazy busy! Four adult sweaters is madness! Thanks! Yeah I’m a bit of a mad sweater knitter but I mostly do worsted weight with a few dk or bulky here and there. It helps make it go faster. I’m actually putting a sweater down that I started this week, I am down to the sleeves, but I need to do a quick baby blanket!